We can answer your questions about flat roof installation and repair. The flat roof can be enticing to some homeowners or business owners, especially if they’ve had issues with their pitched roof in the past. But what are the benefits and the drawbacks that can help you decide on a flat roof or pitched roof? Quick Installation Flat roofs are much easier to install than normal pitched roofs. While it’s true other parts of the building will have to be worked on for building stability, flat roofs are finished in much less time than pitched roofs. Cheaper Materials If the first question you asked yourself when you thought about a flat roof was “Are flat roofs cheaper?” then here is your answer. Most flat roofs are cheaper than pitched roofs. The materials are cheaper, the installation process doesn’t cost as much, and they are relatively easy to replace if that becomes necessary. Additional Space Opportunities For houses or businesses in particularly crowded or population dense areas, a flat roof is the perfect opportunity to create more usable space. As long as the building can take the weight, a flat roof can turn into a rooftop garden or lounge. Easy Repairs The repair process is relatively uncomplicated for a flat roof. There aren’t many places in the roof itself that can become damaged, and it’s easier to go to the spots that need repairs. Easier Access If your roof needs to be inspected or repaired, the person doing the job will have a much easier time getting on the roof and staying on it. Pitched roofs can have serious stability issues and are more likely to result in a fall injury. Drainage Problems Water rolls right off of pitched roofs due to the angles. Flat roofs need special draining equipment to ensure water drains off of them properly. Some are also slightly angled to assist with water drainage. Heavy rain could have an adverse impact on your flat roof. Insulation Flat roofs have less space for insulation. This means you’ll be more affected by extreme weather shifts like a heat wave. This could make an impact on your energy costs. This can be offset by having reflective materials on the roof. Building Stability Pitched roofs add stability to the home they are installed on. Flat roofs don’t, and as a result, contractors have to reinforce other parts of the building to ensure they don’t have issues or collapse. Style Issues If you’re building a home, the flat roof is more likely to stand out in the neighborhood. If you have a homeowners association, they may take issue with your bold choice. At the same time, the flat roof removes the potential of an attic as storage space. We can talk you through the different materials available for your flat roof installation. What are the different types of flat roofs? There are many different types of flat roofs to choose. The most common is the tar and gravel roof commonly used by business buildings. This doesn’t have as much appeal to homeowners, however. There is the PVC membrane option, which is welded onto an insulation board in strips, limiting potential entry points for moisture from the outside. There is also EPDM rubber, which is a membrane that gets stretched out over the roof. It usually comes in one large piece to limit the potential for the elements to get in through the seams. This is a useful option for homeowners who only want water in their water purification system, and not damaging the rest of their home. TPO is a material that comes in sheets that get fastened to insulation boards. This is a good options for people worried about the problems with flat roof insulation. 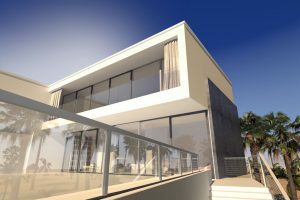 But what is the best material for a flat roof? That depends on what matters the most to you. Cheaper materials could mean metal is the right choice for you. For someone concerned with leaks, the EPDM rubber would be a solid choice. Our certified professionals can install or repair your flat roof to perfection. How long do flat roofs last? For someone concerned with the longevity of their roof investment, a flat roof offers the potential of a longer return. While normal pitched roofs with shingles on them normally last between 10 to 15 years, flat roofs are insured for between 10 to 20, with the possibility of lasting up to 25 years before needing to be reworked. This all depends on the materials, but with proper maintenance, inspections, and upkeep, your flat roof can last almost a decade longer than a standard pitched roof with tiles. 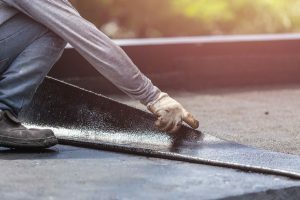 To ensure that you make it to this step, however, it’s important to hire quality flat roof contractors. By getting specialists to handle your roof installation, you ensure that the chance for leaks and damage are minimized. They will also know what is required to reinforce the frame of your home. This makes them less likely to miss a spot, and means less time researching the necessities that come with a flat roof installation. If you’re in Osage Beach and Lake Ozark, MO and interested in flat roof installation or repair, contact Thompson Roofing & Reconstruction at 573-789-8367. Posted in Uncategorized on February 8, 2019 at 9:19 am by Thompson Roofing & Reconstruction.